I am a big fan of wasting time. My best ideas usually arrive in the shower, when I "should" really be doing housework or a little marketing work. Quiet time to think and relax is hard to come by as a mother. When I have the chance to dash off to the shower for some alone time, I can't bring myself to skimp on the steam and hurry through. Yes, I could probably save more water, but if I don't have time to be creative, I just don't feel like me. I have intentionally developed strategies to help me relax and cope with stress, I make time to waste time. Putting in the time and thought to develop these strategies pays off often. I find that the little time I have to be creative is much more efficient time. I work faster, I work harder, and I am more inspired, when I make time to relax. "People are more likely to have a big breakthrough when they're relaxed." Rick Newman in "Why Relaxing More Could Make You a Genius"
Creative relaxation techniques don't need to be earth shattering new ideas. Reading, walking, painting, spending time doing nothing with my husband, are all ways I give my brain a break from the mental ruts that are so easy to get stuck in. Switching gears, engaging with others, and having fun are far more effective ways for me to help my brain come up with creative ideas and solutions. "Scientists have determined that people in a relaxed state and a good mood are far more likely to develop innovative or creative thoughts..." This interview on NPR's Fresh Air with John Lehrer, author of Imagine: How Creativity Works has deeper insights into the creative process, relaxation, and perseverance. So, where does the strategy come in, if the techniques are pretty basic? Taking a shower isn't an earth shattering new idea. When you are a mother, strategy comes in with the "when" more than the "what." It is difficult to relax when you have a toddler clinging to your leg, let's face it. When are you supposed to have time to waste time? Two options for finding time to creatively waste time are available to you. The first option is to utilize your support system. Use your husband, sister, mother, friends, or babysitter to help you find those alone minutes to relax. They can help you in a couple of ways. Simply engaging with others is helpful and brings in new perspective. Chat about what's going on outside your world of babies. How is your sister's career going? What community connections does your husband or friend have that can support your creative endeavors? What about a playgroup? 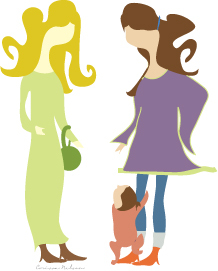 Network with other moms and develop mutual support. Can your husband watch the kids run around the yard after work while you take that 20 minute shower? Your second option is to learn to relax even when you are alone with the baby. The jogging stroller on a nice day can be your creative friend. Strap your baby in, have refreshments and security blankets on hand, and hit the trail for some nature inspiration during summer. Watch the snowflakes fall while your kids make snow angels in the winter. Next time you find yourself in the shower, brain storm about finding time to let a few minutes just slip on by for the sake of your creativity. Does the creative process end with the shower? Well, no. It really doesn't. After that spark of an idea, some serious work, trial, error, editing, and reworking are in store. Perseverance is critical to the success of a new idea, and yet, that new idea does need to start somewhere. For me, the new ideas start in the shower, right in the middle of glorious time wasting. Do you have any great ideas for jump starting creativity? Please share!